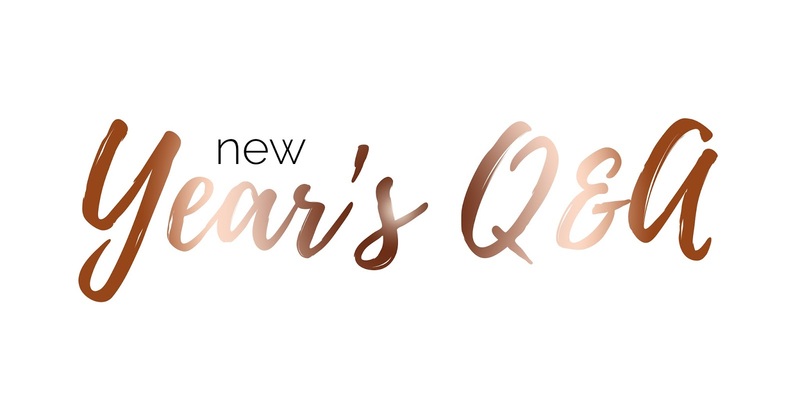 Over the past week I have been asking you guys for some questions for my New Year's Q&A and today I'm going to be sharing them with you! Some of these questions are very random, whereas others are based on my New Year's goals and what I hope to achieve this year! I absolutely love Q&A's compared to tags as I'm answering questions which my readers have specifically asked me and would like to know about me; it's a little bit more personal! @Naomiroawn_blog asked; Do you like to set huge goals, or small achievable ones? I like to set both! Huge goals push me to work harder, whereas I make small achievable goals every single day! @Effieisbored asked; If you made resolution's how well have you kept with them so far? I've already messed up one of my resolution's! I wanted to work out every single day, and I haven't worked out for a week now, oops! @Candidlydarling asked; What is your biggest goal for your blog this year? My biggest goal is to blog every single day, I'm not entirely sure if this will 100% happen, but I'm going to put in every little bit of effort to make it happen! It would be a great achievement for me. @Delladriscollx asked; What's one thing you'd like to overcome this year? I'd like to overcome my rubbish body confidence and to feel completely comfortable in my own skin. It's something I need to work on but I'll get there eventually. @JessicaKGxx asked; How did 2016 impact upon your goals for 2017? I'd definitely say blogging has made many goals for 2017. I want to work harder and succeed and 2016 has helped some of my goals so much. @Devonmetcalfe_ asked; What's your all time favourite beauty brand? My all time favourite beauty brand is either Makeup Revolution or Rimmel London. I have so many of their products and they're incredible. I recommend them to everyone. @Frejalkane asked; What do you plan on achieving by the end of the year? There are so many different goals which I have for this year but I really hope to lose 8-10kg! @Mademoisellllee asked; How are you inspired to write posts? Is blogging "worth it"? What do you think of "tag" posts? Every day of my life inspire's a new post for my blog. I would definitely say blogging is worth it if you're passionate about it. Personally, I'm passionate about writing so blogging is worth every second. I absolutely love tag posts, I've already posted two so far this month! @Foodandbaker asked; What's the number one thing on your bucket list? My number one thing is to have children and to get married. I know you can't really say this is like many other people's bucket list's but it's my life dream to be married with children and my bucket list will be complete once these have both happened. However, I do want to see Michael McIntyre and Michael Buble live though! @Silverglowx asked; Which celebrities and bloggers inspired you the most in 2016? Celebrities, honestly; none. I'm not really a follower of celebrities. However, Lexi from Lexilife, Lauren from loulabellrose and Lauren from itslittlelauren have inspired me the most with my blog! @SlightlyVoguish asked; What inspired you to start a blog? For so long my mum has told me to start a blog because I absolutely love writing. I've been in a poetry book for writing when I was little and I even wrote a song for the same company and I've been in one of their song books as well. It's the one thing I definitely feel like I'm good at and if I can make someone smile through my writing, then I'm happy. If you have anymore questions, leave them in the comments!